First off, Let me quickly introduce myself. Name's Adam. I go by Acz on Twitter & EZA streams. Been a patron since the very beginning and have yet to miss a month. Anyway, I'm here with something very important. 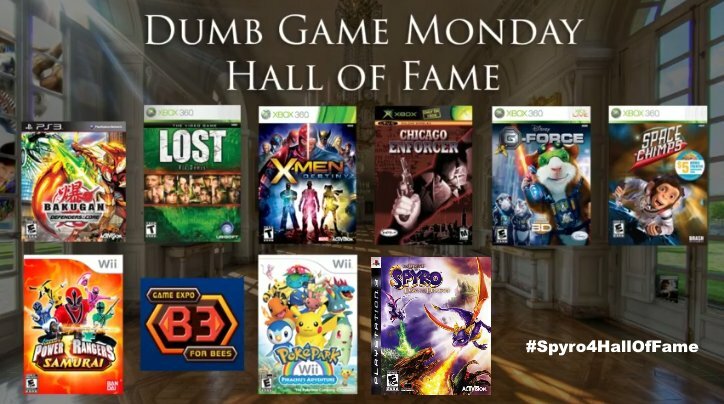 As you guys know, The final Dumb Game Monday for Spyro just wrapped up and now it is our Duty to decide whether or not the game makes the Hall Of Fame. I am here to launch a week long campaign to gain support for Spyro when the time comes. I have already started a hashtag, #Spyro4HallOfFame and would love if other allies joined in to support. While Bosman stated that he does think the game deserves Hall Of Fame status, in the end it all comes down to us to decide the games fate. I myself do think it deserves to take its place in the Hall Of Fame for several reasons, one of them being that we have put dumber games into the Hall before like Space Chimps and Power Rangers. Honestly if those 2 can make it, Spyro should be a given. So Allies, Who wants to finally make Spyro the Bride instead of the Bridesmaid? Made a new promotion for today. Not sure if I'll do one every day, but I at least want to do it 2 more times. 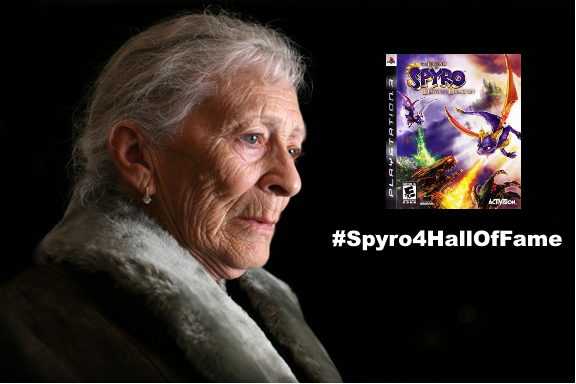 I'm thinking my next one will be Grandma holding a copy of the game. If Anyone has suggestions on pictures, feel free to comment or make your own to help support the cause! I'm all for adding the game to the hall of fame. Compared to some of the other games from Dumb Game Monday, this one's a clear pick for me. is in the HOF and this is clearly better so it deserves to be there as well." Every Hall of Fame has a few duds so if you judge requirements by them then you'll just keep lowering that bar. Not a statement about Spyro or anything just a general opinion. Judge the Dumb Game Monday HOF by the Pokeparks and the G-Forces rather than by the Power Rangers Samurai's. Oh, I'm fully aware of that. Power Rangers, and Space Chimps are stupid games, but I'd be lying if I said I didn't learn to love them. In terms of dumber than Spyro. I don't know. Looking back, yeah, Spyro is a super dumb game, but I feel we did learn to love it through it's good times and bad. I do feel that all the games in the HOF deserve to be t=in there, some are just dumber than others.